PHOTO: Allen Ramsey, DWCPhoto.com. Highlands senior center Evan Richardson (74) goes for a block in Friday's game against Covington Catholic. The Bluebirds beat the Colonels for the 15th straight time, 44-22. PHOTO: Allen Ramsey, DWCPhoto.com. Highlands senior linebacker Jared Dougherty (10) celebrates after recovering a fumble against Covington Catholic. Dougherty recovered two fumbles and scored 14 points in the Highlands win. Dougherty extended his Highlands and Northern Kentucky record of career point-after touchdowns to 203 good for fifth in Kentucky history. Once the Highlands Bluebirds walked off the field at LT Houchens Stadium at Western Kentucky University last December with their state-record 23rd state championship, this Class 5A state semifinal match-up of defending state champions loomed as a huge possibility. But both the defending Class 4A champion Bluebirds (8-5 overall) and defending 5A champion Pulaski County Maroons (12-1) had to win their respective regions first. The Bluebirds won the 3rd Region pulling away to beat the Covington Catholic Colonels (5-8), 44-22 and the Maroons rallied past North Laurel, 28-24 in a battle of 11-1 squads to win the 4th Region on Friday. "They know (the Maroons) are a great team," said Brian Weinrich, Highlands Head Coach. "They have already seen them on film. They knew in the back of their minds that was a potential team they could play against. We have all the respect in the world for them. They have some phenomenal football players. We'll come in (Saturday), see what we can do to get better and put ourselves in position to have a chance in that game." In state semifinal games, winners of odd-numbered regions play host in odd years. Thus, the Bluebirds knew they could play four home playoff games entering the postseason and will have that opportunity once again the day after Thanksgiving. Game time is 3 p.m. in Fort Thomas. Highlands moved up from Class 4A to 5A this season. The Bluebirds spent the 2007 to 2010 seasons in 5A winning state championships in those four years. 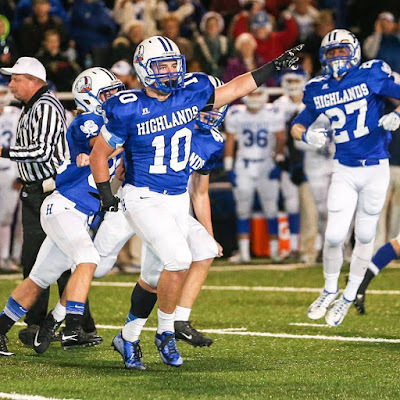 Highlands rallied past Owensboro, 49-42 in the 4A title game last year. Less than 24 hours before that on a dreary, rain-soaked Friday evening, Pulaski County captured its first-ever state championship with a 14-7 decision over Graves County. The only other time Highlands and Pulaski County have met on the gridiron came in 2009. The Bluebirds dominated the Maroons, 52-12 in the 5A semifinals in Fort Thomas before taking down John Hardin, 35-7 in the state championship game. The Maroons won their first-ever region and district crowns that season. Austin Collinsworth rushed for 127 yards and a touchdown on seven carries all in the first quarter and Patrick Towles completed 6-of-9 passes for 181 yards and a touchdown to Nick Buten to lead Highlands to that win. Buten finished with three catches for 101 yards. Pulaski County veteran Head Coach John Hines has led a remarkable turnaround since taking over in 1999. The Maroons had never won a playoff game at that point. The Maroons went 2-8 and 3-7 in his first two seasons as head coach. But Pulaski County won its first-ever playoff game, 43-35 at Louisville Fairdale in 2002. The Maroons followed that up with a breakthrough 11-2 campaign in 2003 losing only to the Boyle County Rebels in both the regular season and regional title game. Boyle County wound up winning its last of five consecutive straight state championships that year. That was a state record until Highlands broke it with six straight between 2007 and 2012. The Maroons went through some rebuilding years before that 2009 campaign. They lost to Harlan County in the region title game in 2010 and 2012 before making it back to the state semifinals in 2013 edging Anderson County, 20-17 before losing 49-14 to Bowling Green in the 5A state championship. Highlands and Pulaski County have a common opponent in the Scott County Cardinals. The Cardinals handed the Maroons their only loss of the season, 53-31 on Aug. 28 in Georgetown before beating the Bluebirds, 54-28 a week later. With the playoff win over Covington Catholic on Friday, Highlands won its 30th straight home playoff game dating back to a 17-0 loss to Lexington Catholic in the 3A region title game in 2005. That also marked the last time in 145 games the Bluebirds have been shut out. Highlands also captured its ninth straight region crown and 33rd overall. That is the longest-running streak in Kentucky. Mayfield is second with seven in a row with a 24-13 win over Owensboro Catholic in the Class 2A region title game Friday. Highlands senior kicker Jared Dougherty made five extra-point attempts in the win against CovCath moving his Highlands and Northern Kentucky career record to 203. Dougherty became the seventh kicker in Kentucky history to hit 200 or more in his career and moved into fifth on the all-time list. Dougherty passed the 201 by former Louisville Trinity kicker Karl-Heinz Williams (2000-02) and 200 by former Hazard kicker Austin Delpont (2006-09). Next on the list is former Bell County kicker Monte Merrick (2005-08) with 216. Pulaski County senior Derek Burgett is third on the list with 243. Former Scott County kicker Palmer Ward (2010-13) and Lone Oak kicker Jack Coorts (2007-10) hold the state record with 297 each. Newport Central Catholic, Beechwood and Simon Kenton also moved on to the state semifinals with region championships Friday. NewCath pounded Lloyd Memorial, 41-0 to move into the 2A semifinals against Danville (12-1) and Beechwood moved into the 1A semifinals with a 21-9 victory at Louisville Holy Cross. The Tigers travel to Russellville on Friday. The Tigers own 11 state championships, but none since 2008. Beechwood has not been able to solve Mayfield in the state semifinals since then. The Tigers are 0-9 all-time against the Cardinals. 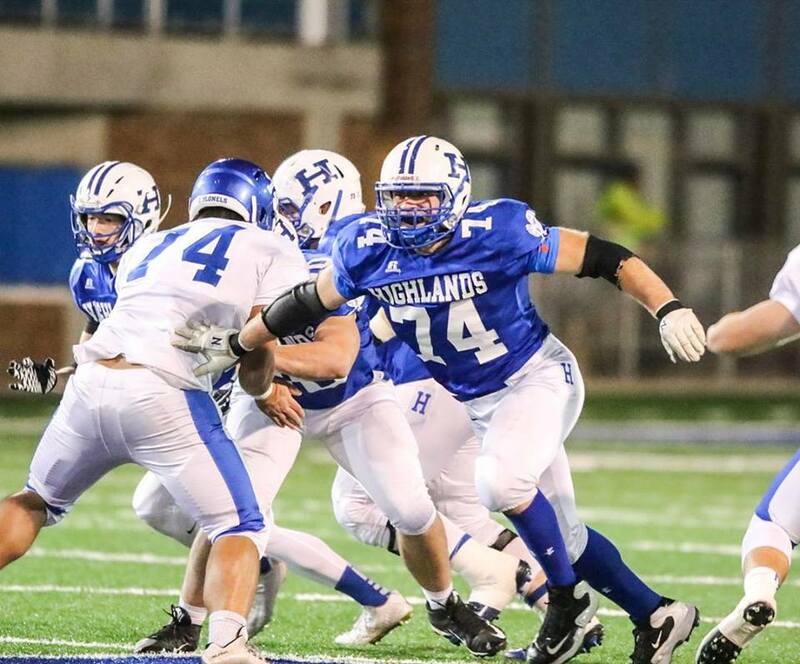 Undefeated Simon Kenton (13-0) was one of five Class 6A schools to beat Highlands in the regular season. The Pioneers won their first region crown since 2008 edging Cooper, 13-12 on Friday. Simon Kenton plays host to Lexington Lafayette in the semifinals Friday. Lafayette led by senior offensive lineman and University of Kentucky commit Landon Young upset Scott County, 36-30 on Friday. All five of the teams that Highlands lost to advanced to at least the second round of the playoffs. Louisville St. Xavier lost to Louisville Trinity in the second round last week and Ryle lost to Simon Kenton. Highlands graduate Chris Wolfe has guided Louisville Male to the state semifinals for the second time in three years. The Bulldogs edged the Trinity Shamrocks, 20-19 on Friday to stay unbeaten at 13-0. That win means Highlands has a chance to take sole possession of the state record for most football state championships. Male takes on Central Hardin in the state semifinals on Friday. The Bulldogs are seeking their first state championship since 2000. The other state semifinal game sees Louisville Fern Creek travel to Bowling Green in a battle of 12-1 teams. Fern Creek edged South Oldham, 21-20 on Friday and Bowling Green handled Owensboro, 41-12. Highlands is 3-1 all-time against Bowling Green and 1-0 against Fern Creek. Five teams advanced to the state semifinals by a point. That includes Elizabethtown's Peyton Payne catching a 37-yarder from Jack Wilson with just 1.9 seconds left to lift the Panthers to a 32-27 win over Caldwell County. Just down the road, Johnson Central edged Scott, 27-26 on the last play of the game. The Golden Eagles lost to either Highlands or Covington Catholic in the playoffs between 2008 and last year. Another team that Highlands beat in four previous 4A semifinal match-ups was Lexington Catholic. The Knights edged Louisville Central, 14-13 in the 3A region title game to win their fifth straight region crown. Pulaski County and Highlands are not the only two defending state champions meeting in the semifinals. Last year's two-time 1A and 2A champions Mayfield and Louisville DeSales face off in the 2A semifinals at Mayfield.